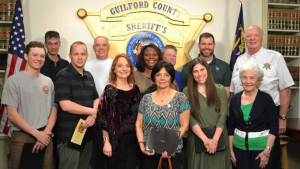 GREENSBORO — It might be difficult for any of the 15 graduates of this year’s Guilford County Sheriff’s Citizens Academy to choose a favorite block of instruction. After all, some areas class members looked forward to exceeded even those high expectations while others — those that might have been expected to be average at best — were informative, insightful and, at times, funny as all get-out. Members of this year’s graduating class of the Guilford County Sheriff’s Citizens Academy included Calvin Atkins, Sean Bumgarner, Stephen Carrico, Carmen Custodio, Michael Johnston, Valerie Jones, Mary Jo Moody, Jordan Robison, Joseph Saldarini, Alex Southwick (of Summerfield), Jennie Spallone, Taylor Sprouse and Kevin Spradlin (of Summerfield). Not pictured are fellow graduates Cynthia and Michael Ramm. During a dozen Thursday evenings and Saturday mornings in February and March, over approximately 40 hours, members of the Volunteers in Police Service, led by Joyce Swaim, and community coordinators Master-Cpl. J.A. Page and Deputy T. Chandler shuttled, herded and corralled members as they heard from guest instructors on a wide variety of topics: from CCH permits to crime scene processing, and from animal control to jail operations. Class members received a wide-ranging talk from Guilford County Chief District Court Judge Tom Jarrell — who talked about court operations and procedures, domestic violence issues in the county as well as the Guardian Ad Litem program, among other things — as well as in-car experiences with members of the DWI Task Force at the District 2 office in McLeansville. Academy participants also went hands-on in a shooting simulation, which provided a number of scenarios that officers and conceal-carry permit-holders face on a regular basis, toured the mobile command center and received a tour of the Guilford County Detention Center. The class included Summerfield resident Alex Southwick, an aspiring law enforcement officer in his early 20s. The youngest member of the class was Jordan Robison, a high school senior. On March 29, it wrapped up with a brief graduation ceremony to recognize the commitment class members had made in completing the program — and the obligation each had in taking the next step. 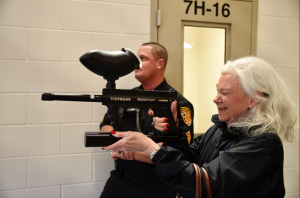 Citizens Academy member Mary Jo Moody, a retired educator, tries her hand with the pepper ball launcher during a tour of the Guilford County Detention Center in downtown Greensboro. The launcher is a tool, officials explained, to quell unruly inmates without using lethal force. more than 660 sworn officers, detention officers and civilian employees of the agency. He shared some war stories, talked about how crime had dropped during his tenure as sheriff, and proclaimed that in his agency there was no room for sexism for racism. Barnes also spoke of the great need for detention officers. While the number of vacancies for sworn officers is at or near zero at all times, Barnes said it’s a different ballgame for detention officers because the job is not easy and sometimes unpleasant. * Editor’s note: PiedmontPostNC.com editor Kevin Spradlin was a member of this class. Lieut. 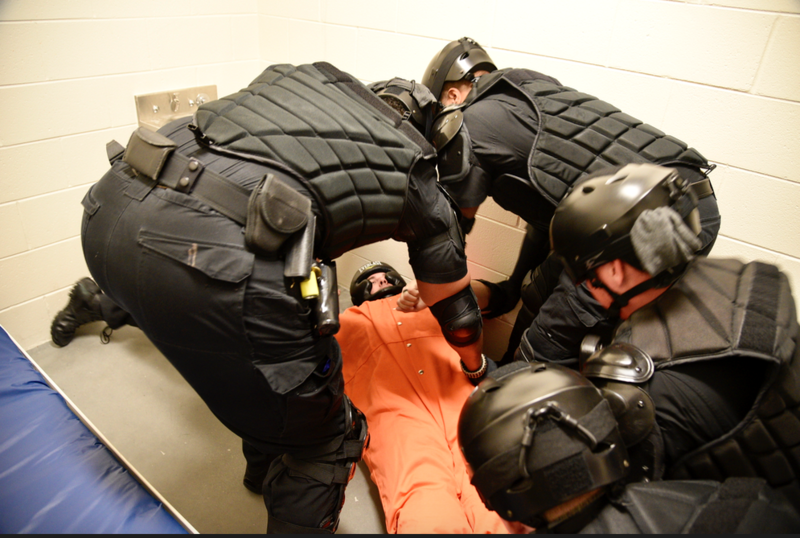 Johnnie Maynard plays the role of a noncompliant inmate during a demonstration of the detention center’s tactical team.